Moving on from the cerebellum into a practical workshop on the right and left sides of the brain. Interestingly, the two cortices are separated by the corpus callosum and are structurally and physiologically different from each other. So what about this left / right thing? How can it improve my mood or performance? Like anything else in the body balance is key, the same applies to the brain, may unpleasant things such as pain, anxiety, over-eating, depression come from imbalances in the brain. When we talk about the cortex people often just think of the frontal lobes and personality. 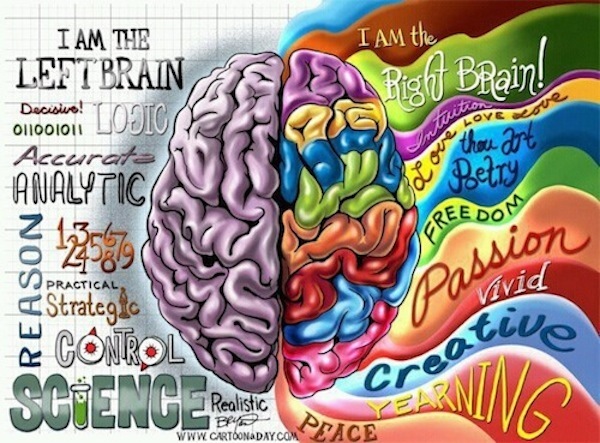 A left brained person being more logical, linear and mathematical and a right brained person being more creative and emotional. Some of the positive attributes of the left cortex are its happier, stimulates the immune system, controls tone on the left side and voluntary movement on the right, processes sensory information from the right side of the body, some sound from right ear . It is curious, but impulsive. It regulates approach behaviors such as happy, angry, surprise and fright, which are both a good and bad thing. It also has a role in controlling pain on its own side of the body and is involved in intricate precise movements. Right side is more cautious, but intuitive and creative. It manages the immune system by inhibiting it. It likes novelty and is good at understanding metaphors. It regulates retreat behaviors like disgust, sad, fearful and flight. The right side controls pain and muscle tone on its own side and voluntary movement on the left. The right brain processes big movements of the body in relation to the environment so important in sport. The right brain doesn’t ‘worry’, which is a good and bad thing. So what will we being doing in this workshop? This sounds very interesting, I play semi professional hockey and I’m studying. I’ve got good, body awareness, yet I keep getting right hip and right knee pain and I’m sure it’s something neurological. I got concussion from a hockey ball about a yr ago, and this hip thing started about 3 months after. If the cricket ball hit you on the left side of your head at the back and messed up your left cerebellum and left vestibular system. The vestibular system job is to control posture and to keep you upright, it controls extensors on its own side, but it also has an effect on opposite side knee, I’ve noticed this by working with knee issues. So left vestibular, right knee. Also the left vestibular system feeds into the left cerebellum. Left cerebellum feeds to RIGHT cortex, right cortex sets tone on right and controls muscles via the reticulo-spinal tract, and controls voluntary movement on left. So a dodgy left vestibular / left CB will result in a reduction in firing to R mid brain and R cortex. So there will be stability issues on the right which will affect the R knee, R low back and R hip / R Sij. Sara, this is a great post! And as there has been posts about the fact that left-handed people aren’t “creative”……I beg to differ. My niece and daughter are both left-handed and they are such free spirits and are very artistic! 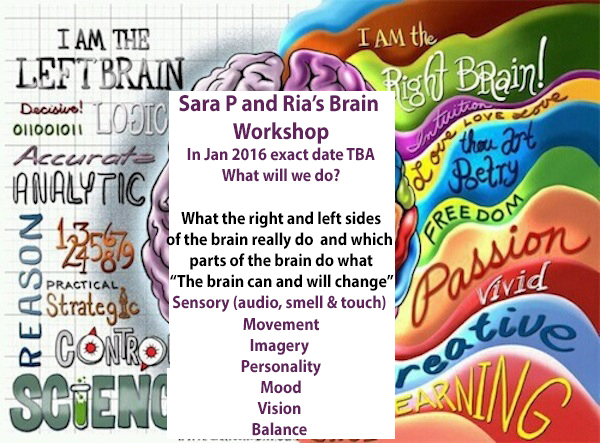 I would love to attend one of these workshops, but we’ll be out of the country for a bit. Hopefully we can catch you next time!